Triangle Construction has been a premier commercial builder in the Upstate since 1947. The name “Triangle” is an ode to the company’s three founders who came together to form a cohesive triangle which combined ingenuity, hard work, and dedication. Triangle Construction needed their website to equally represent these values. We have thoroughly enjoyed working with Engenius for all of our website design needs. In addition to always being extremely helpful and patient with us, their team provides thoughtful insight and suggestions on how to make our website the best that it can be. We could not be more pleased with our experience with Engenius! 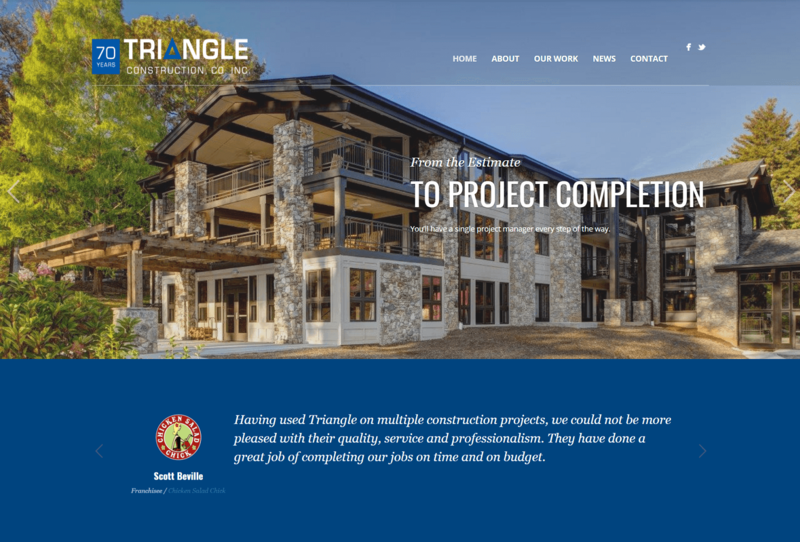 To effectively reach new clients with an intuitive and visual website that would tell Triangle Construction’s story and provide an edge over their competition. 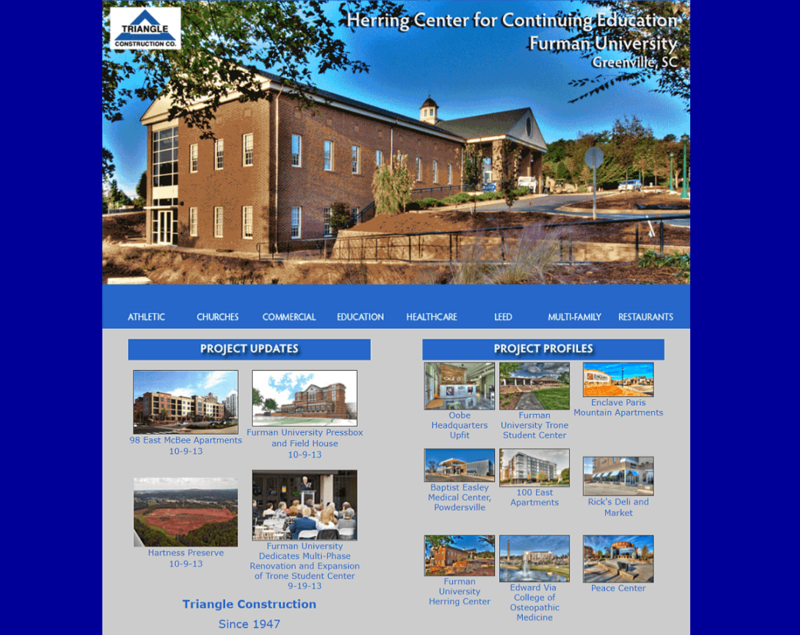 Triangle Construction’s previous website was essentially one large project portfolio. While past work is important to Triangle Construction’s audience, it isn’t the only crucial element to differentiate them from their competitors. To help tell Triangle’s story, we built an “About” page on their new website. This page outlines who they are beyond just a builder: a loyal partner with a rich history. On this page, users can learn about Triangle Construction’s team, values, and experience. Of course we didn’t leave out detailed information about Triangle Construction’s work, either. The new website features dozens of projects in a comprehensive project portfolio. As an added feature, users can sort the project list based on industry, allowing for a more streamlined user experience. This is certainly a step up from Triangle’s old website on which users were directed to a separate page for each industry. In addition, the main menu disappeared from the top of the industry-specific pages which made it hard to flow through the site seamlessly. Overall, the new website does a much better job at engaging Triangle Construction’s target audience. The site is highly visual, easy to navigate, and helps put Triangle Construction a step above their competitors. To help accomplish Triangle Construction’s objective of effectively reaching new clients, we knew we needed to do a better job of actually getting in front of these users. We decided to leverage their online presence and implement an ongoing SEO campaign to help reach more users searching for the services that Triangle Construction offers. After beginning SEO services in March 2016, Triangle Construction has seen an improvement in search engine results over time.